"Paranormal Activity 3" sounds even more unnecessary than "Paranormal Activity 2" (which we found unworthy as a sequel from our review last year). We still have the same question - how much more can you squeak out of the "Paranormal Activity" franchise? The proposition sounds bad, really bad. But, "Paranormal Activity 3" shocked us. Not only out of fear but because it does bring something new into the table and breathes life into a used up horror concept. Although at first glance "Paranormal Activity 3" may look similar to its predecessors (because it really does), but look deeper then you will know that the little nuances they did change or bring in make this the sequel that should have been. And we even dare say that it towers over the original. In 2005, Katie and her sister Kristi discovers a box of old videotapes of their childhood. A year later, the tapes are mysteriously burglarized and they never see what's inside those tapes. In 1988, Katie and Kristi are both young girls. They live with their single mother and her boyfriend, Kristi has an invisible friend named Toby which she interacts with regularly. Her mother thinks this is just a phase children have while Dennis thinks it is more than what it is. When Dennis accidentally records an invisible entity (seen when dust falls on it) on tape when an earthquake hits, he decides to put up several cameras. Soon after that, paranormal activities start happening and it seems that each passing night, the hauntings are getting stronger and stronger. "Paranormal Activity 3" is not the scariest film in the series and yet it's the most interesting out of the three films. It does this by keeping the movie fast-paced (wherein the hauntings start early and just builds up from there) and having story and character elements that are tightly integrated to the story arc. It also keeps conversations at a minimum but this does not mean that the characters are less believable. It actually does the complete opposite and it somewhat forces these same characters to try "inventive" ways to find out what's really happening inside the house. We especially liked the "roving" camera that ramps up the tension significantly. As expected, the acting was top-notch. You can feel the emotions coming out of the characters. This is the most consistent quality of the "Paranomral Activity" films. 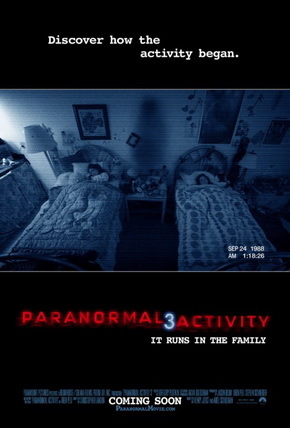 Overall, "Paranormal Activity 3" is successful because it has an interesting story properly told by the characters within the film. Even minor characters contributed and no character was out-of-place. It reveals and explains a lot that the other films lacked on. But most importantly, it learned that keeping regular conversations at a minimum does indeed help in making it a bore.